Below is a list of a selection of online periodicals relevant to the study of Hebrew language, Jewish history or Judaism. The list is very impressive, but by no means exhaustive. Each title is hyperlinked; by clicking on it you will be taken to the relevant pages of the Bodleian E-Journals database. In order to access the materials on-line, you will need your Single Sing-On, as well as the VPN connection, if browsing from outside of the University of Oxford Network. 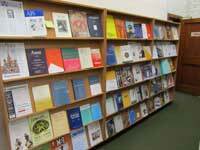 Some of the periodicals listed below, as well as many others, are stored in our stacks at the Muller Library in Yarnton in print format – and can be searched for via the online library catalogue SOLO. This entry was posted in Uncategorized on 25 September 2013 by zeidlerm.